The way Facebook ads work is that you’re in an online auction bidding for the chance for your audience to click (or do whatever your goal is) on your ad. You only pay when somebody completes your event—clicks on your ad, for instance—and your competition is other ads that also target the same audience. You shouldn’t ever need to worry about bidding against yourself unless you’re running campaigns or ad sets targeting the exact same audience. As soon as you target the same audience twice with multiple campaigns or ad sets (in the exact same time period), you’ve placed yourself in direct competition with yourself for prime real estate. You’re trying to place two different ads in the same place at the same time and show them to the same people. Most likely when this happens, your campaigns will underperform and underspend. If you’ve also set a bid cap on your ads (which limits the value of the bid your ads place at auction), you may even find the ads don’t deliver at all. You’ve placed your ads into a bidding war that they can never win, and you’re going to outbid yourself into oblivion and then never spend a cent or gain a single conversion. Here’s what to do: Avoid targeting the same audiences at the same time with multiple ad sets or campaigns. If you absolutely have to do this (maybe you want to create a sales funnel), you can use Facebook custom audiences to exclude segments of the audience based on their interaction (or lack of interaction) with your ads, posts, page, or website. A great way to create ad funnel audiences is to run video views ad campaigns because Facebook can segment audiences based on specific videos they’ve already viewed. Conversely, Facebook can’t segment based on specific posts or ads that people have viewed. Bid caps can really mess up your Facebook ads if you’re not careful. These are designed for specific circumstances and you really need to know the value of your conversion event before you mess with these. 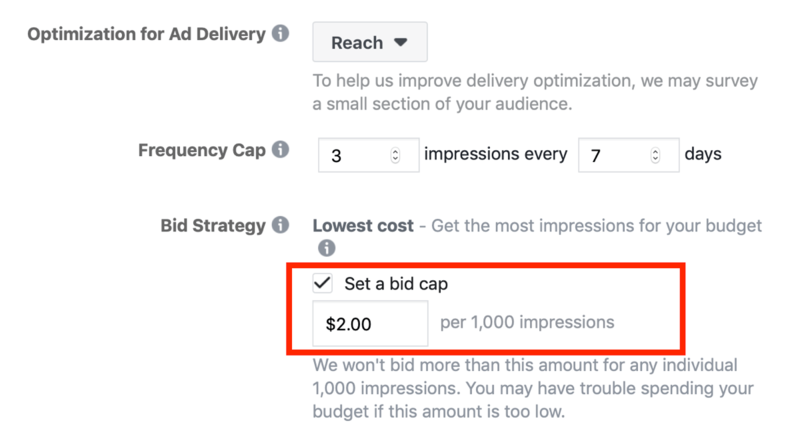 A bid cap is intended to tell your Facebook ads the maximum value that you’re willing to spend to gain your desired result (click, impression, whatever you’ve chosen). You can use them for campaigns that are selling a service or product with a fixed price (an eCommerce campaign for $30 sneakers), but they can also put a wrench in the works of your campaign if you underestimate the value of that desired result. Here’s what to do: Setting a limit on bids or a bid cap can lower performance of your ads (some audiences are just more valuable than others). If you have this turned on and are experiencing a dire situation with conversions, the best move is to try raising your lowest bid or cost cap to improve delivery. You’ll probably eat through your daily budget or lifetime budget a little faster, but you’ll see more conversions and your delivery will be stable. 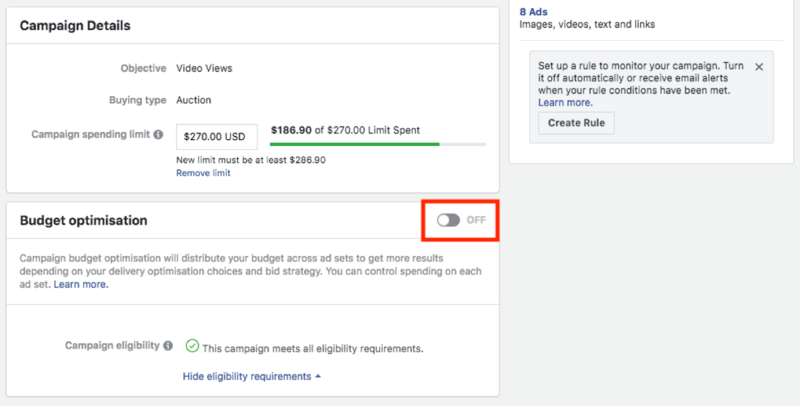 Note: Some Facebook ad campaigns with low bid caps won’t deliver at all, especially if you combine this with a low daily budget. If your campaign isn’t delivering at all, double-check your budget coupled with your bid caps. Facebook allows for campaign budgets to be split equally across several ad sets. This sounds ideal until one of your ad sets is underperforming compared to the others within a campaign. Regardless of performance, Facebook will continue to split the budget for all of these ad sets equally. That is, unless you set up Campaign Budget Optimization. This option will spread spends across a campaign depending on performance, pushing budget into high-performing ad sets when needed. This means your money goes directly where it should to the ad sets that are giving you results. Here’s what to do: To set this up, you need to make sure your ad sets all have the same delivery (landing page views, for example) if you’re using lowest cost bidding. Once this is in place, you’ll be able to check a box at the campaign level under Budget Optimization in your Campaign Details. When it comes to campaigns that have conversion events (purchases, link clicks, lead generation, etc. ), you actually need a minimum of 50 conversions a week for Facebook to be able to optimize delivery and consistently deliver your ads. Read that again: You need at least 50 conversions per week. Facebook has a limited conversion window that it optimizes from. If your campaign is struggling to convert at all, Facebook won’t be able to settle the campaign into a stable cost or delivery. You’ll likely watch as your ads tank, then eat through budget, only to tank again with no clear indication why. Here’s what to do: While you should of course look at conversion optimization (Are your ads relevant to your audience? Why would anyone want to click? Should you change your creative? ), one way to fix this is to consider using target cost bidding rather than lowest cost bidding. If your audience targeting is spot-on, your creative is good, and you’re happy with fewer than 50 conversions per week, you can stabilize delivery using target cost bidding. Campaigns are generally set to lowest cost by default (which makes sense because it keeps your bid to a minimum), but target cost can be useful when you really want to stabilize bids. Instead of trying to bid the minimum amount (lowest cost), you can tell Facebook to bid around an approximate amount (target cost), which will keep your delivery and costs consistent throughout the campaign. Ad fatigue is a real concern with social media ads, and when it comes to Facebook ads, you’re going to want to avoid it. When people are bored with your ads, it drives up costs and drives down relevance scores (as more and more of your audience starts hiding your ad). Ads that have a small audience or run for a long period of time will start to see this happening. There are a few things you can do to avoid this. First, set up sales funnel ads using custom audiences based on those who have interacted with a certain post or ad, and then make sure to exclude these audiences from initial campaigns once they’ve made their way down your sales funnel. Second, in a campaign with a Reach objective, if you have reach and frequency buying available to you (as some people do), you can set frequency caps in your ad sets to limit the number of times people see your ads in a certain timeframe. By limiting how many times your ads show in a period of time, you can help reduce ad fatigue. Importantly, these caps need to account for the number of ads you have within an ad set. So if you have three ads within an ad set, your minimum frequency cap should be 3. You can also set up rules in your Ads Manager, which can automatically turn campaigns on and off as needed. For this, you’d create a frequency limit condition. 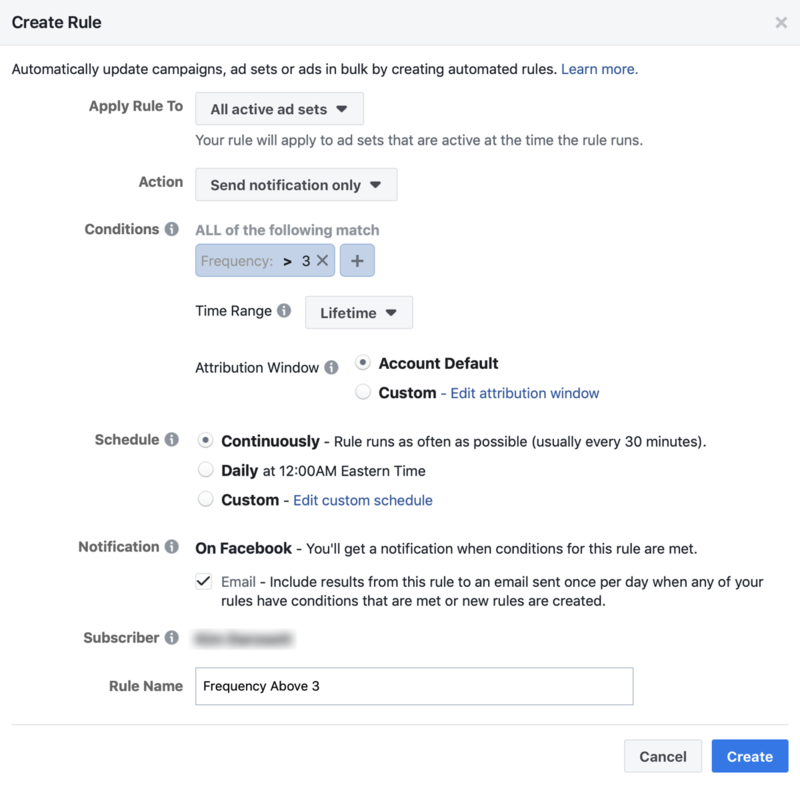 If you’re not comfortable with automatically turning campaigns off, you can also set up rules to notify you via email of a condition. There are other issues of course when it comes to placements, optimization, and audiences for your Facebook ads. 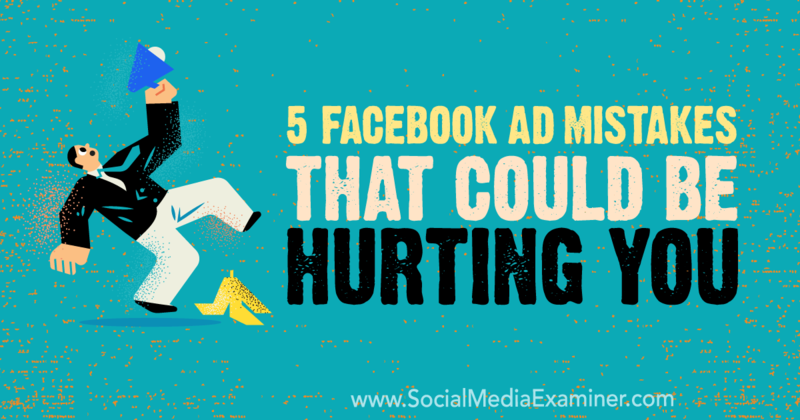 These top five just scratch the surface but they should give you an idea of the kind of logical thinking you need to fix performance issues in Facebook ads. It’s all about reading the data (always check your relevance score and frequency) and then being able to take action based on what you’re seeing to improve your ads."